1) Providing data to inform response by District, Regional and National child protection actors with respect to the vulnerabilities of children following the eruption and its subsequent environmental sequelae. 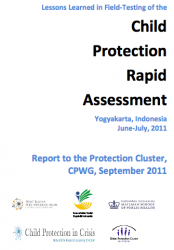 2) Adapting the field-testing version of the CPRA to the Indonesian context and building capacity in its use - in cooperation with the Indonesian government – for deployment in future emergencies. 3) Refining the CPRA tool – and identifying broader lessons for its use – in a manner that will inform subsequent use, adaptation and roll- out of the measure globally. This report focuses on the third of these goals, identifying lessons learned with regard to six major issues: preparation, team dynamics, contextual adaptation, cultural translation, data collection and data analysis.